Nathan, after a brief recount of his situation to this point (stabbing Reichsmark and being "infected" by his liquid steel after a depressed life because of a football injury), Nathan awakens from fevered dreams to find Dr. Mid-Nite standing over him, explaining that his skin has turned to solid steel. Despondent, Nathan goes to see his few surviving cousins. Arriving, he finds that he cannot control his strength, tearing off a door. Mid-Nite offers to help. 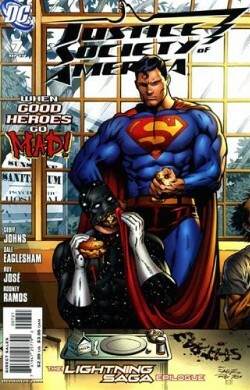 At the insane asylum, Superman arrives to talk with Starman over sloppy joes. At a large forge, the JSA pours molten metal over Nathan, giving him a solid steel uniform that will slow his strength and movement by half, enabling him to interact with normal people. Nathan is furious that they give his uniform the same colors as Commander Steel, but he changes his tune when Power Girl comes in and lets on that followers of the Fourth Reich are attacking kids. Superman's conversation with Starman doesn't get very far, but Starman does offer a few clues and oblique hints. At the school, the JSA heads in, cautioning Nathan to wait outside and "catch." They throw the Nazis out, and Nathan quickly dispatches them, finally taking up his mantle, calling himself "Citizen Steel." Back at the hospital he meets with his family, deciding that he can finally feel something again. Story - 5: Nathan's story really appealed to me when it was first begun, and it really saddened me to see it sidelined for the crossover, but it's understandable. Here, friends, is a key way to avoid doing exactly what Countdown is doing, where everything is ridiculously and continuously reiterated as part of the universe and ongoing story. Where Countdown would take an entire issue informing us that Bart died and how, Johns shows that even when you have to brush a potentially lost readership up on what's going on with Nathan, all you need is one tightly scripted, intelligent page of re-telling, throwing in emotion and some new cues. Phenomenal writing. The arc of going from an inability to feel and a lack of desire to take up a familial mantle, and the process leading to that ultimate decision is not only a great reflection, but a key example of the ongoing family and legacy dynamic this book has strongly pursued under Johns' leadership. Superman's simple, brief moment of accepting a sloppy joe with a friend was so strangely bittersweet, it draws such sympathy to Starman and makes you want to emulate Supes in a number of ways. Intelligent character, and it's something I hope to one day emulate. The fight with the Nazis was strong, as was the suit and its description. At first I waffled with the idea of a hero wanting to blunt their power, but imagine the concept of a guy doing it to survive who, when pressed, will have to literally rip off his own skin to grow more powerful, shedding the ability to feel. There's some GREAT subtext there, and knowing Johns, that's purposeful and will come back. #@*% yes, Stargirl. Boo to Nazis. I love it. 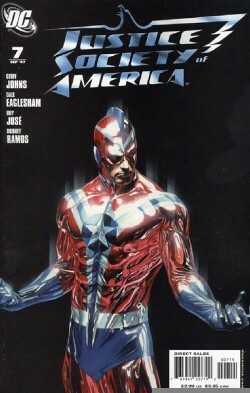 Art - 4: Eaglesham's faces and static dialogue scenes seem to suffer in this issue in a few ways, but otherwise, the action and depictions are, as ever, uniquely his own and fun to look at. Two moments that really threw me off were Power Girl's "Okay," which seemed lackluster, and the eating, which seemed odd. But the forge, the battle, and a lot of the character beats were just as strong as ever. Cover Art - 3: The image suffers from Steel not being centered, and strikes me as not particularly dynamic, particularly given Ross, who I expect much better from. Here's one of the cases where the cover's history and the need to fit that groove fights against it, unfortunately. Still, the metallic effect is neat, and it's not a horrible piece. For any other artist, it'd be a 4, but I expect the phenomenal from Ross.